You can tell how invested Yuzu is in the program any time he performs it, and that goes for all the programs I've ever seen him skate. 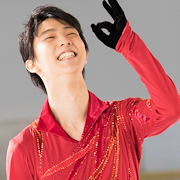 The way that I boil it down is that to me, Yuzu is someone who has a lot that he wants to say with his skating and a clear sense of who he is artistically and what he wants to convey with each performance, while Nathan doesn't particularly have anything that he wants to say or convey, he just views skating as a sport where you go out there and do only what you need to do to rack up the points that you need to win. I agree that the technical & total scores should not be directly compared because of the different systems. PCS, though, should be similar enough for comparison in principle. And, from what I've seen of the sbs videos, people are mostly using them to compare transitions. I wonder about that. From what I've seen, PCS tends to reflect technical scores to some degree, so if the overall tech score average across all skaters goes up, so will PCS. Simply put, I don't think either PCS score reflects reality all that much. There was a video after the Sochi Olympics around March 12, 2014 in which they discussed Yuzu's popularity amongst his female fans and how he resembled a character out of the world of manga and anime. To check out this point, they visited an anime school and one of the instructors showed two anime characters and explained how their height could be divided into a certain number of equal segments which was considered ideal (the "golden proportion" referred to above). They then put an image of Yuzu from his Sochi PW between the anime characters and he had the same number of equal segments as they did confirming that he had the same ideal proportions as the anime characters. They also pointed out that all of the anime characters had unusually long necks and that this was considered attractive. It was pointed out that Yuzu also had the same unusually long neck as the anime characters confirming that he had all the attributes of a character from the manga and anime world! Unfortunately, I was unable to find the link to that video. I believe it still exists. Some other satellite may be able to find it. I had a link to that YT video. Unfortunately, that video and the user's account have been deleted. Probably part of that YouTube purge of figure skating videos and accounts. Hopefully it will get reuploaded on YT or elsewhere. The instructor also said that Yuzu has an androgynous look, which is popular in shojo manga. I would add that his heart-shaped face gives him a "pointy chin", which is also typical of manga characters! That explains it. I went to look for it too but over half of my library is deleted. I think I downloaded it before most stuff got purged but it's always a pain to look for anything in the hard drive - I downloaded everything in a hurry so none of it is organized. Seems like a weird video to get deleted since it doesn't compete with anything but he uploader probably posted more current videos that got the channel deleted. I never thought about the pointy chin but I'm watching Bleach right now and, you're right, all the major characters and most of the secondary characters have the pointy chin. The ahoge and hair in the face are really common as well. I've been thinking about beauty standards in other countries and it's effect on popularity. From the conversation in the WTT thread and some articles I read, it looks like the Chinese admire extreme slenderness in both males and females, which surprised me. I knew about the females and all the crazy challenges like the sheet of paper challenge but didn't realize that the guys are also held to this standard. It seems pretty common in Asian countries to want pale skin and the higher nose bridge and height for men. I thought the big eyes was a pretty common beauty standard as well but Yuzu doesn't have that. Is Boyang also considered very attractive in China? He seems to have a lot of the same physical characteristics as Yuzu but doesn't have that more feminine body shape. Is this androgynous look also prized in China? Korea has similar beauty standards right? But my understanding is that he's not popular there, though largely because of social/political tension in the 2 countries' histories. Is this golden proportion/mean/ratio thing more of a Japanese thing or a general principal of aesthetic? I tried to look it up but got a math thing and some explanations on how to use it in design. What about the "small face" thing? Is it fair to say that Yuzu and Yuna Kim are the 2 most popular skaters in the last 30 years or so (the only skater I can think of that would rival them is Sonja Henie, maybe Witt)? Mao is pretty popular too but not quite as famous as these two? Michelle Kwan is probably the most famous American skater but from everything I hear she wasn't very popular outside the US - do you think winning gold would have changed that or do you think being more average looking would have held her back from attaining the fame of the other 2 no matter what? How much of Yuzu and Kim's popularity is due to their physical beauty - before each of their second Olympics they were very successful but not more than a lot of other champions. How much of Alina's (and Masaru's) popularity is due to her being so beautiful? around here, I don't think it's as common for people to find Yuzu's look attractive, but I keep to a pretty small circle of friends. Most of the time the reaction to me looking at his photos has been "that's a guy?" and he's not nearly as famous here as everywhere else, but I think in the US that's true of every foreign athlete except maybe Maria Sharapova and Anna Kournikova. ok. sorry for the rambling, lol. That's a lot of really shallow questions. I think aesthetic sense are actually pretty similar between China, Korea and Japan, because their entertainment industry in some way cross-pollinate each other? White skin, big eyes with double eyelids, small heart-shaped face, high nose, skinny long limbs and androgynous and youthful looking features are prized in all three countries. Yuzu ticks all the boxes other than the double eyelid. His eyes are only small when he smiles, they are not small when he is serious and not smiling. I actually think Yuzu's looks are more closer to China and Korea taste than Japan though? I can actually name some Chinese and Korean celebrities that I think Yuzu resembles, but not so much Japanese ones (despite I watch more Japanese dramas). But then his golden proportion body is rare. Most people have a 5:5 torso to legs proportion, some you might even have 6:4. Having a 4:6 proportion is already considered extremely good proportions. Yuzu's fame and popularity is not due just to his physical attributes. If he was just a pretty face and a beautiful body but was an airhead with no personality, he would not be loved the way he is. I was watching the British Eurosport coverage of Yuzu's "Origin" at the Saitama Worlds and Simon Reed was saying (again) that he has been covering sports of all kinds for decades and he could not name any other athletes that has or had whatever Yuzu has other than Tiger Woods, Roger Federer and Mohammed Ali. I think he was referring to popularity, charisma, fan following, the "it factor", whatever. In a piece and video entitled "The Legend of Yuzuru Hanyu", CNN's Corey Wire said that he had played nine seasons in the NFL and had covered sports as a journalist for many years but had never witnessed the passionate fan reaction that Yuzuru receives. The reason for Yuzu's fame and popularity is due to his athletic ability, natural talent and, of course, his looks, but it is so much more than that. It is his personality and charisma. People are unable to describe what it is that they find charming about Yuzuru. People tend to ramble on and on when they speak of him. Basically, he is an incredibly good human being. He is sympathetic and empathetic. He is humble, modest, full of humility. He is honest and person of pure integrity. He has a natural charisma that cannot be faked. At the same time, he has a "hate to lose" personality. He never makes excuses and owns his failures and shortcomings and credits others for his successes. He welcomes challenges and has an incredible ability to overcome obstacles. In short, he has all the qualities that people admire, regardless of which culture you belong to. We all aspire to be like him. PS: Did I mention that he is exciting to watch? Others may occasionally get more points than he does, but they don't excite me and make me passionate the way Yuzu's skating does. I believe that it's also a cultural thing, european/american culture is very different. Wow! Thanks for the info! I think if he lands 4A for the first time in history, that would also bring more international coverage and hopefully more fans! Media Coverages and press internationally are what brings new fans the most I guess. I think Yuzu became popular for all the reasons listed above, but all of them come together for, what I think is the (or one of ) main reason, and that is he naturally induces in people a strong feeling of..wanting to protect him? almost like a "motherly" feeling, and there is no stronger feeling than that in the world. Remember that commentator who said to "wrap him up in cotton wool" when he was young? that is basically how to describe it. And of course after you get to know more about him as a person, including his strong will, injuries etc. that feeling becomes even stronger. There are many athletes in the world that makes you admire or be in awe of them, and Yuzu is the king of doing that, but he has this juxtaposition of being the strongest of the strongest in his field yet there is an air of fragility that makes him more endearing than your typical top athlete.